As almost always happens when I race, I woke up before my alarm. In this case, that meant about 4:30am since the Team DetermiNation bus was scheduled to leave for the start area on Staten Island from just outside Central Park at 5:45am. It was a good thing we lucked out with an extra hour of sleep and that I had mostly adhered to my "lights out" time of 11pm the night before. I came back from our Team DetermiNation pasta party inspired, but with a terrible migraine, so I had been concerned about my ability to get any sleep before the race. Thankfully, I had gotten a good night's sleep on Friday (I'm told that's the key anyway) and I slept off my migraine for a good hour before my pre-race prep and my actual bedtime. By the time my morning wake up rolled around, I was actually feeling pretty good and as ready as I was going to be for my 26.2 adventure. 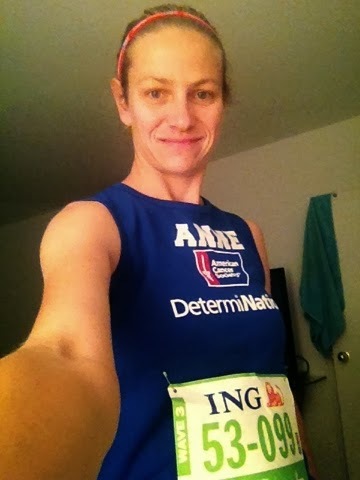 I posted this photo on Facebook before leaving for the Marathon. My friend Scott who had already been more than hospitable during my stay in NYC hopped into a cab with me to make sure I made it over to my Team DetermiNation bus without any problem. I arrived in plenty of time and was on my way to Staten Island by 6am. I was able to catch at least another half hour of shut eye on the bus and then it was through all the security measures to gain entrance to the start area at Fort Wadsworth. Everything was so organized and the race officials and volunteers were a proper measure of enthusiastic and serious. I couldn't believe I was actually there and I couldn't have been happier to finally find the Charity Village area! In our Team DetermiNation tent we had hot coffee, shelter from the wind, and inspiration beyond measure. 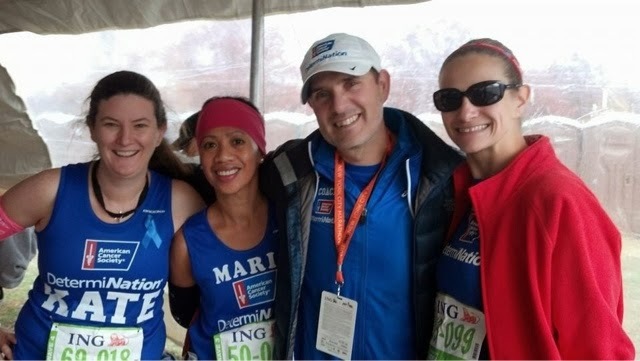 I was able to spend time hanging out with my friend Melissa and her husband Paul - fitting since Melissa is the reason I found myself at the start line that day. 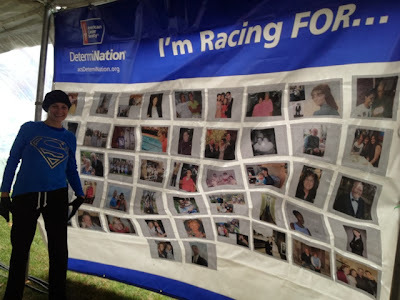 There was a beautiful banner in the tent which featured photos of many of our loved ones who motivated us to run with the Team - it included a photo of Joe, Domani and me from our trip to LBI in July 2011. Then, not long after Melissa and Paul had left to join their Wave, in walked Kate and Alena who I had trained with in NJ. It was so nice to see them and share hugs and take photos together in advance of our own starts. I thought that the morning hours leading up to my start time would drag on, but the truth is that the time just flew by. Before I knew it, our coach Ramon was announcing that it was time for those of us in Wave 3 to make our way over to the start corrals. We watched from just outside our corral as the first wave started across the bridge and it was spectacular. I alternated between watching the big screen that was set up in the start village and the bridge itself which was directly in front of me. I just couldn't believe I was actually there and that in less than an hour it would be me going across that same bridge starting my first marathon. The next 45 minutes passed quickly as those of us in Wave 3 made our way into the start corral and maneuvered our way past all of those waiting for a last minute bathroom break. I was in the corral with Lindsey, another Team DetermiNation runner and I was so happy to be sharing the start experience with her. We ditched our outer clothing along with the other items which would go to Goodwill just before moving out of the corral up towards the bridge. Much of what happened next was a blur except for the moment when they started playing New York, New York and it seemed like the whole crowd started singing along. 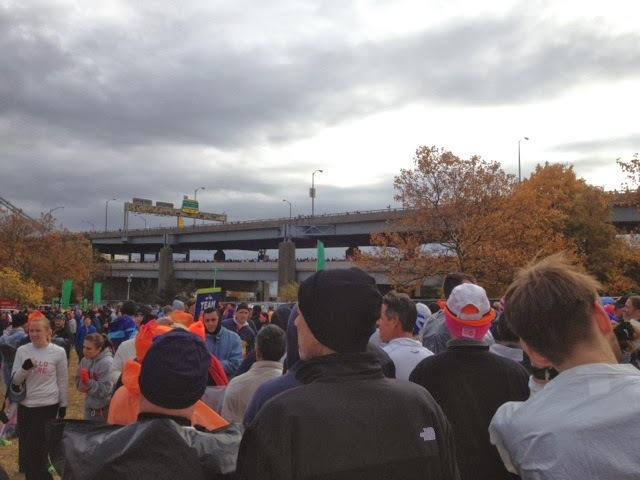 It was the first time along the marathon route that I got teary, but it wouldn't be the last. What a thrill it was crossing that start line after that send off! The first two miles were exciting but so windy that I found myself wondering what NYRR would do if all of our bibs flew off our shirts at the same time and landed in the Hudson. I spent most of mile 3 dodging outerwear that had been thrown to the ground haphazardly and by mile 4 I finally felt like I was in a groove, attributed mostly to the great spectators in the Brooklyn neighborhoods. I found myself running towards the sides of the course, taking my time and high fiving anyone who offered - but especially all the kids. I was having a grand time and enjoying everything about running in NYC. I was able to ride the crowd to keep a cool and steady pace through Brooklyn and into Queens, periodically relying on my random shuffle tunes to provide a little pick me up here and there. Then came that 59th Street Bridge. I had been warned about it. Several friends, including my Team DetermiNation coach, had explained it in detail. I had done all my hill training, but it was still tough. I tried to remember everything I had learned. I went to my race mantra - You + God = Enough - which was written on a rubberband around my wrist (thanks to a tip from my sister Naomi). But mostly, I just kept my eyes forward and thought of Joe. Then, after what seemed like an eternity, I could tell that I was finally running downhill. As I could see the bend that would lead me off the bridge and into Manhattan, I heard the first few bars of Don't Stop Believin' come through my earbuds and there was just no stopping the tears. The timing could not have been more perfect for what that song meant to me and for that moment in the marathon. 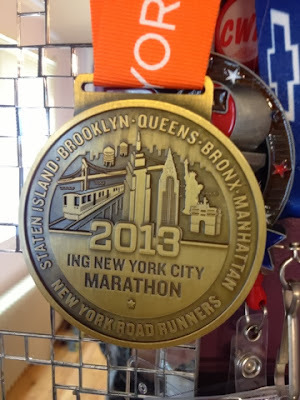 It wasn't just a good running song, it was my Joe calling at a critical moment and it played as I ran past the Team DetermiNation photographer and it continued as I waved at everyone cheering outside Memorial Sloan Kettering where Joe received care. It was one of those moments in life when everything moved in slow motion. I felt like I was the lead actress in my very own perfectly scripted movie. Running just doesn't get much better than that. 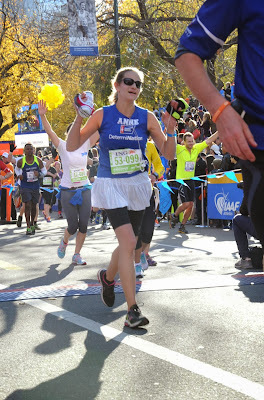 favorite photos from during the marathon. About 20 blocks later at around mile 18 I came upon the first spot where my parents and Scott were waiting to cheer me on. All along the course, I had plenty of people cheering for me by name (thanks to my parents who helped iron my name on my shirt), but there was something really incredible about coming up on Mom & Dad and Scott yelling for me and seeing Mom with her neon sign that said "Go Anne". It was just the extra boost I needed to press on towards the Bronx. Somewhere around mile 20 I got another much needed boost when I caught up with Melissa and Paul as they were running through the Bronx. It was so nice to see them and run beside them as I surpassed that 20 mile mark and ran what with each step became my longest run ever. Once we re-entered Manhattan via the Madison Avenue Bridge I could feel the excitement welling up inside. Five miles to go and the crowds were awesome. I was starting to feel tired and I knew the difficult incline at Mile 23 was coming up. In my mind, I was counting down the streets until 91st where I knew I would once again see my parents and Scott. Somewhere along the way I walked through my first Gatorade stop, stretching out my legs a bit as I walked. 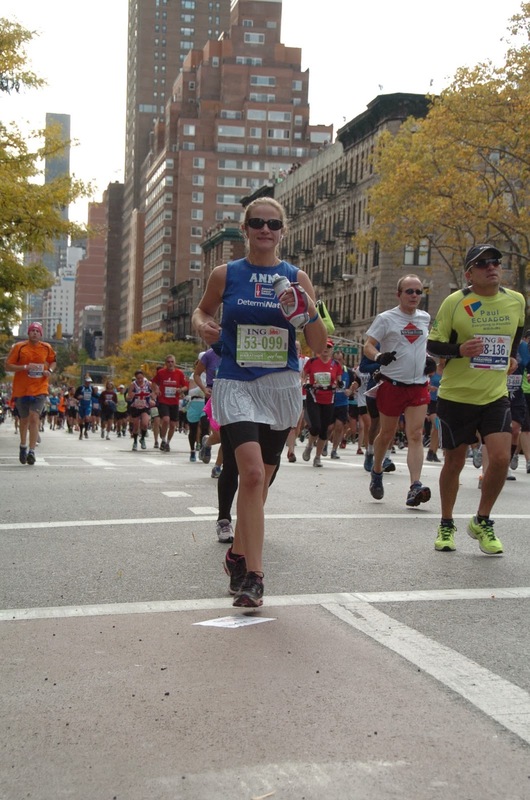 Hearing spectators along 5th Avenue cheer for me by name kept me going throughout that very difficult Mile 23, but I knew that I would need an extra boost to finish strong. As I approached 91st Street and spotted that familiar neon sign I made my way over to my mom and gave her a big hug. She was crying. I was crying. It was another one of those slow motion moments (and not only because I was exhausted!) 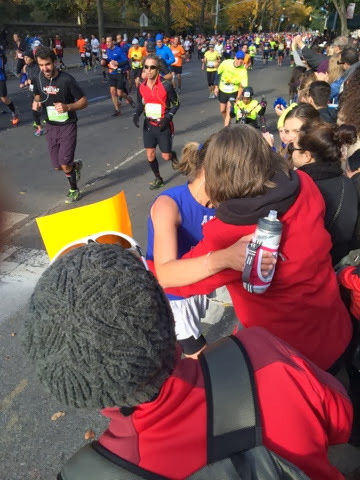 I will remember hugging my mom during Mile 24 of my first marathon for the rest of my life and I'm sure that every time I think about it I will smile and tear up just a little. After the hug, it was into Central Park I went for some beautiful scenery and, yes, a few more hills. I walked my way quickly through one more Gatorade station and then somewhere around Mile 25, it was random shuffle to the rescue again as I was treated to a little Pearl Jam. 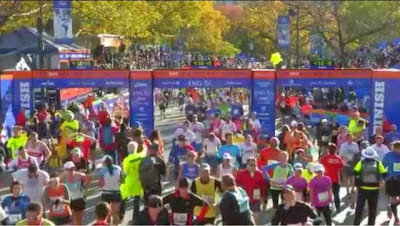 What better song to round out my first marathon than Alive - with just enough grit to push me out of Central Park and onto 59th Street where I ditched my earbuds in exchange for the cheers of what seemed like a neverending throng of spectators. 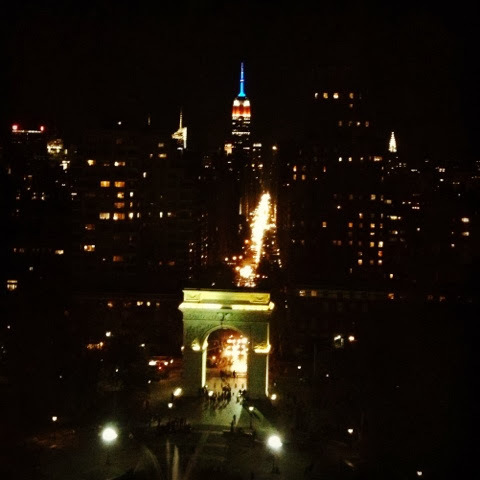 That final stretch was fabulous and as I rounded the bend at Columbus Circle I felt every emotion in the book well up inside me. Five months of training and fundraising and the finish was right there. People were cheering. Big signs counted down every 100 yards for the final stretch. And then I was there. 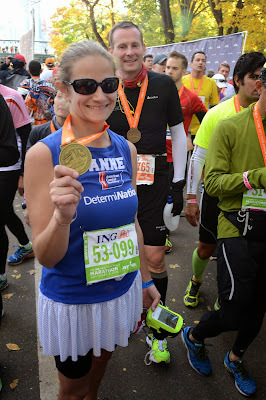 A finisher of my first marathon - the NYC marathon. In my mind, I had a goal of finishing the marathon in 4 hours and perhaps in even less than 4 hours. I didn't do that and I had a feeling from early on that I wouldn't. Perhaps if I were able to run with a 4 hour pace group (there were none available in my slower corral) I could have done it. Maybe if we all weren't dealing with the wind being so tough that day it could have been different. 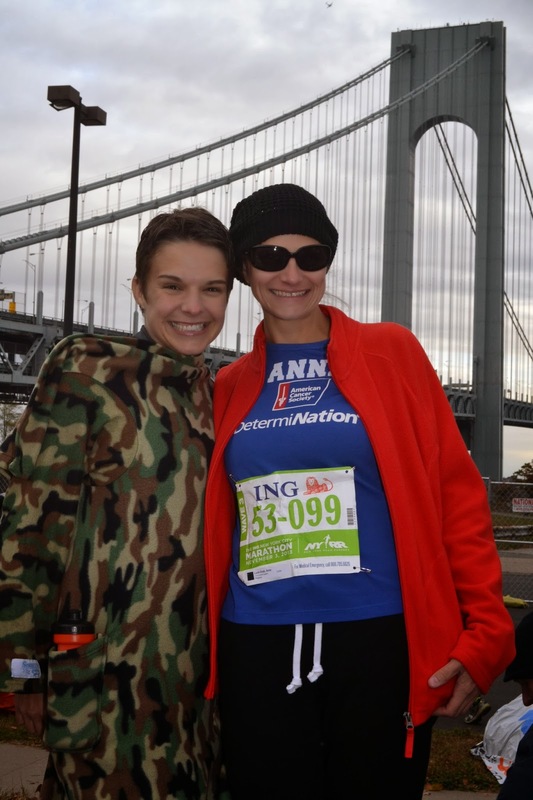 But really, what it came down to for me was that I wanted to enjoy every minute of my first full marathon. I joked with friends and family afterwards that if I hadn't spent 7 minutes and 25 seconds high fiving kids in the outer boroughs and hugging my mom at Mile 24 then I could have gone sub 4 and there is more than a grain of truth in my jest. Looking back though, I wouldn't have run this race any other way. I loved the energy. I loved the love. And I loved taking it a bit easy and soaking it all in. There was something truly wonderful about this race this year in this city. And I'm not ashamed that I cry every time I think about it. 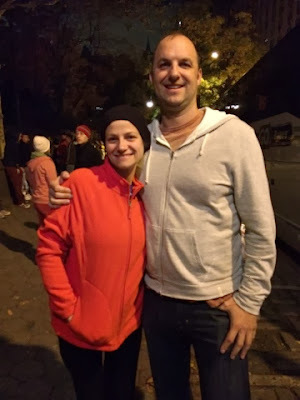 I got to run my first full marathon in memory of my husband Joe in a City that was special to both of us with a Team that was more supportive than I could have imagined and for a cause that is close to my heart. Nothing can top that for your first 26.2. Thank you, New York City, and thank you to all of my friends, family and donors who have supported me on this journey. You were with me for every mile. The NYC Marathon version of "Where's Waldo"...where's Anne? My donation page for the American Cancer Society will remain open for the next few weeks so if you have not made a donation yet, but would like to there is still time. Thanks again for the overwhelming support you have given me - it has been inspirational beyond measure. Anne, the pictures from the marathon look great!! I was just reading up on a few of your posts as well and had quick question about your blog. I was hoping you could email me back when you get the chance, thanks!